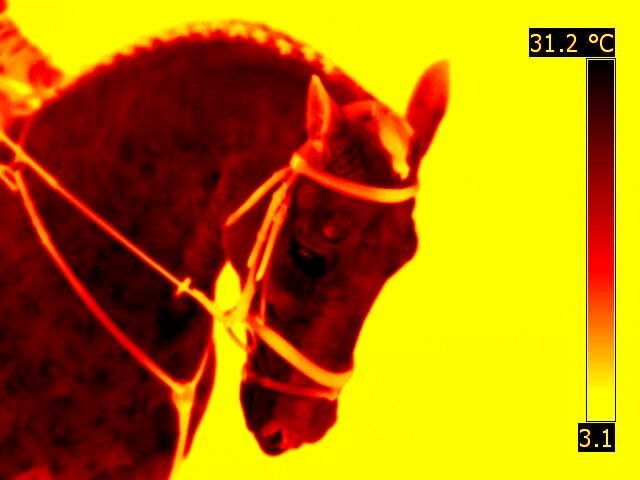 Infrared Thermographic imaging has proved to be a valuable tool in the monitoring of the performing, injured or recovering equine. It is often difficult in veterinary medicine to make a true diagnosis of injury due to changing symptoms or the lack of visibly recognisable symptoms. Add this to the patient's inability to communicate and we are then faced with frustration for the vet, trainer, therapist, farrier, equine professional, and disillusionment for the client. 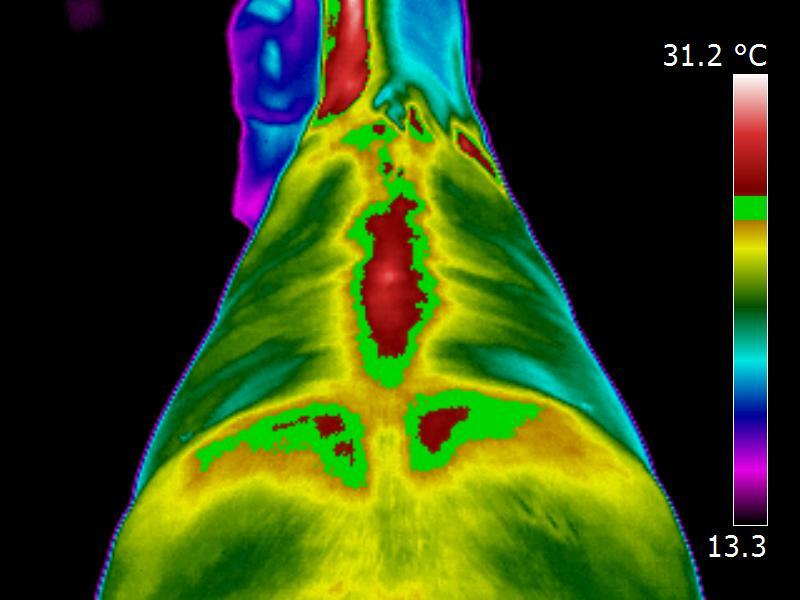 Equine thermography is a non-invasive monitoring tool that uses the very latest Infrared imaging equipment and computer software to detect minute differences in the horse's thermal and neural condition, and allows us to quickly and efficiently identify trauma in an injured animal. Early identification of the location of the injury helps to prevent further trauma, and helps the treating vet to make a decision on treatment needed, and to monitor recovery. 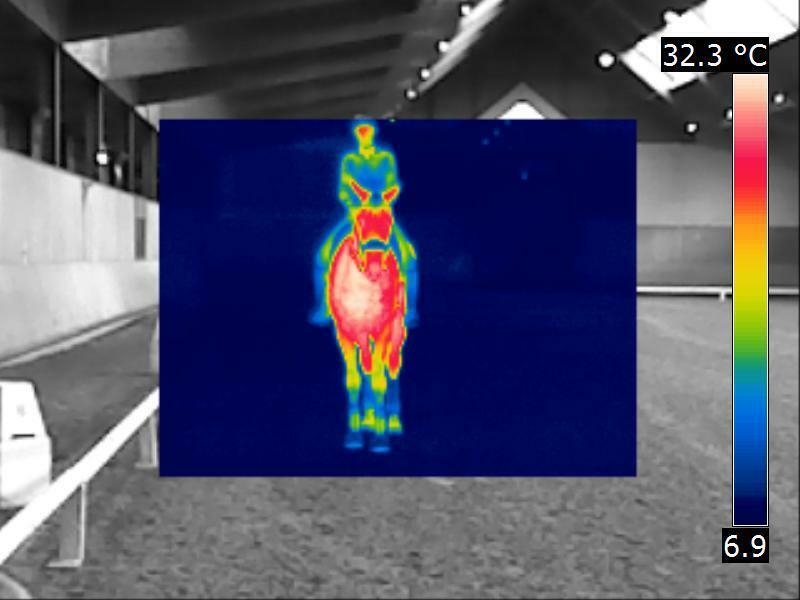 Extensive research in human and equine fields has demonstrated that many injuries and physical conditions can be accurately detected using Equine Thermography, before any physical signs and symptoms are visibly apparent, It also provides a unique way to monitor a horse's recovery from intense activity, injury and illness. Unlike conventional X-rays and MRI scans, Equine Thermographic Imaging does not use any radiation, and is therefore perfectly safe for the horse and the handler. In most cases the results of Thermographs can be provided instantly to enable vets, owners and equine therapists and professionals to make prompt decisions and begin appropriate treatment. 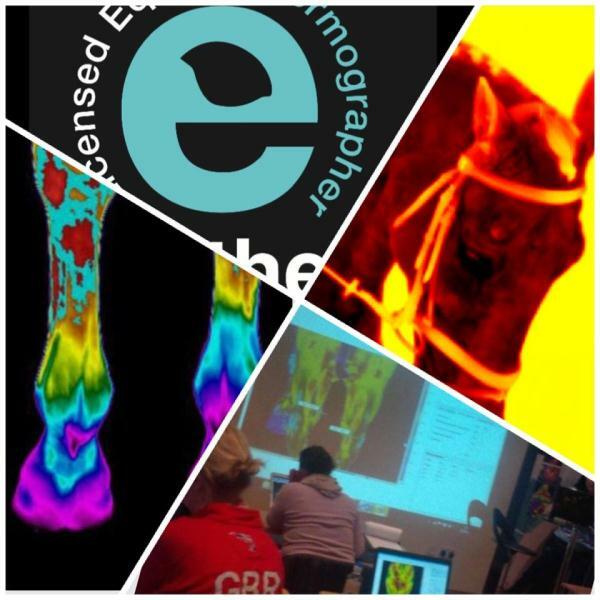 Equine Thermography is an invaluable monitoring tool, which deploys user-friendly, portable equipment which means that imaging can be carried out "in the field". Skin surface temperature should be symmetrical, and any changes observed during the scan can be interpreted by trained veterinarians. Its uses are widespread and can give the veterinarian valuable information into what is going on with the horse. 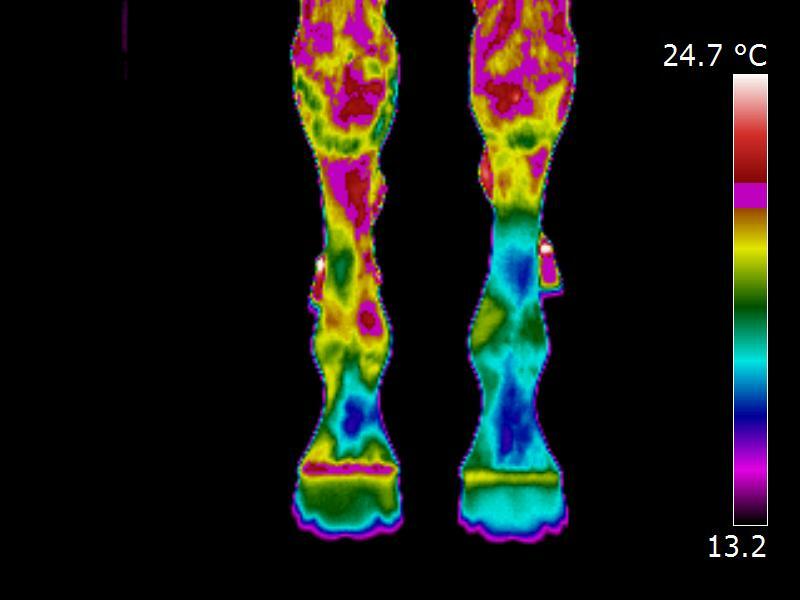 Thermography has been proven to detect damage in structures up to three weeks before the horse shows any clinical signs. Before a structure, such as a tendon or ligament ‘breaks down’ it undergoes a degree of cumulative damage. This weakens the structure without the horse being actively lame, and this micro-damage means that they are much more susceptible to serious injury if they continue to train. 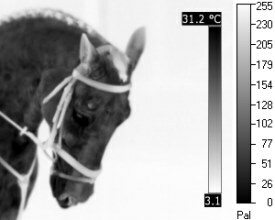 Monitoring horses in training with thermography allows the veterinarian to see this micro-damage and take action to prevent further serious injury. 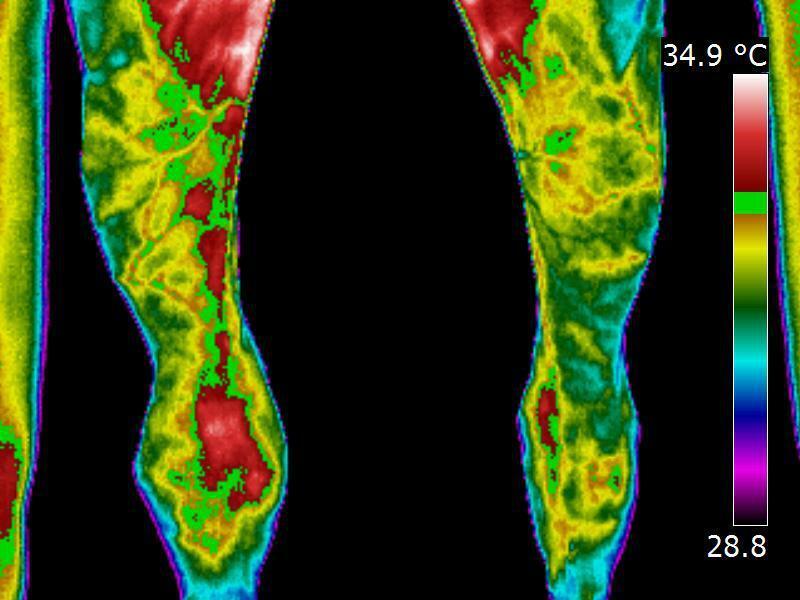 Thermography is a valuable tool in investigating lameness. Not only does it highlight a specific area for the veterinarian to further examine, but it also shows up any secondary or compensatory areas of pain, which can often be overlooked. It is not uncommon for a lameness to be the secondary problem due to an issue elsewhere in the body. Therefore thermography is extremely useful for examining horses with recurring lameness, where the origin of the lameness may not necessarily be from the limb it is lame on. A frustrating complaint for veterinarians is when the horse ‘is just not right’ or is showing poor performance without any clinical signs. 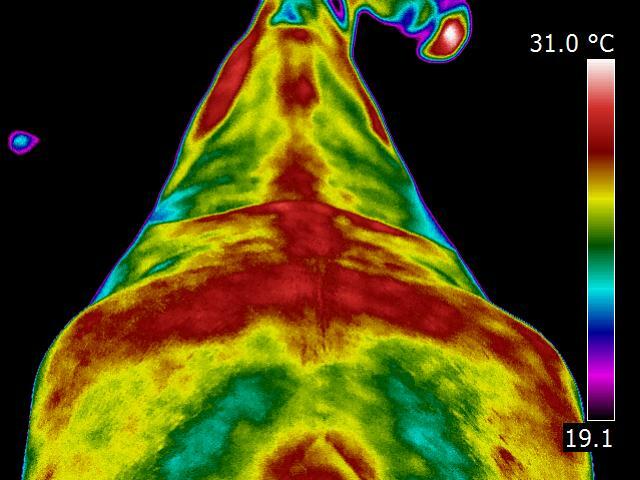 Thermography can detect issues such as muscle damage or saddle fitting issues which can contribute to poor performance.